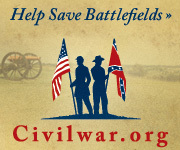 Most differences from the previous quarter reflected one of those army-level organizational changes occurring during the winter of 1863. Specifically, the movement of the Ninth Corps to the Western Theater. Battery A – At Albuquerque, New Mexico with two 12-pdr field howitzers and two 3-inch Ordnance Rifles. 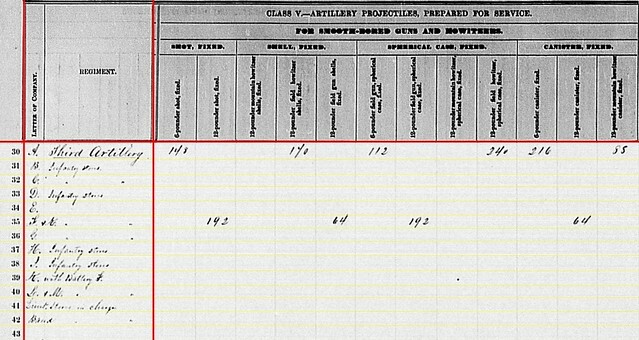 Less a pair of 6-pdr field guns reported in the earlier quarter. Unknown to me is who commanded the battery at this (or any other) stage of the war. 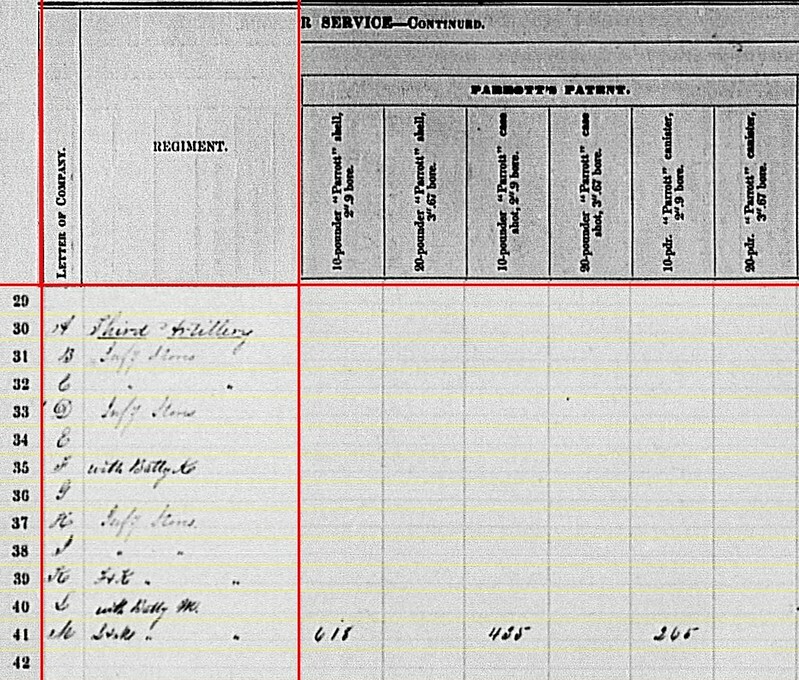 Battery B – No location given or guns listed. The annotation is “Infy. Stores.” The battery remained at Fort Point, San Francisco, California. 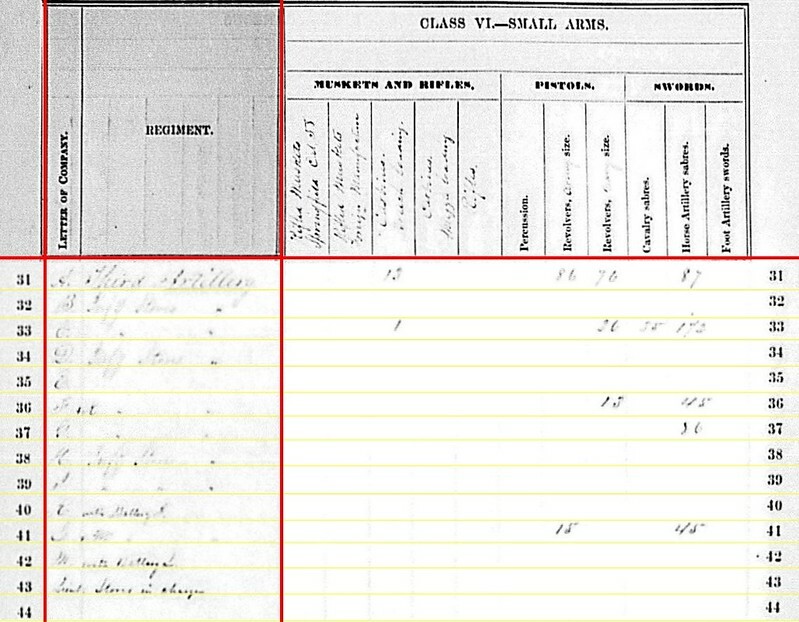 Battery C – Reporting from Camp Bayard, Kentucky with six 3-inch Ordnance Rifles. But this battery was not in Kentucky. Part of the Army of the Potomac, the battery started the winter in the Horse Artillery then moved to the Reserve Artillery. Lieutenant Henry Meinell was in command of the battery. Battery E – No return. Serving in the Department of the South, posted to Hilton Head, South Carolina. 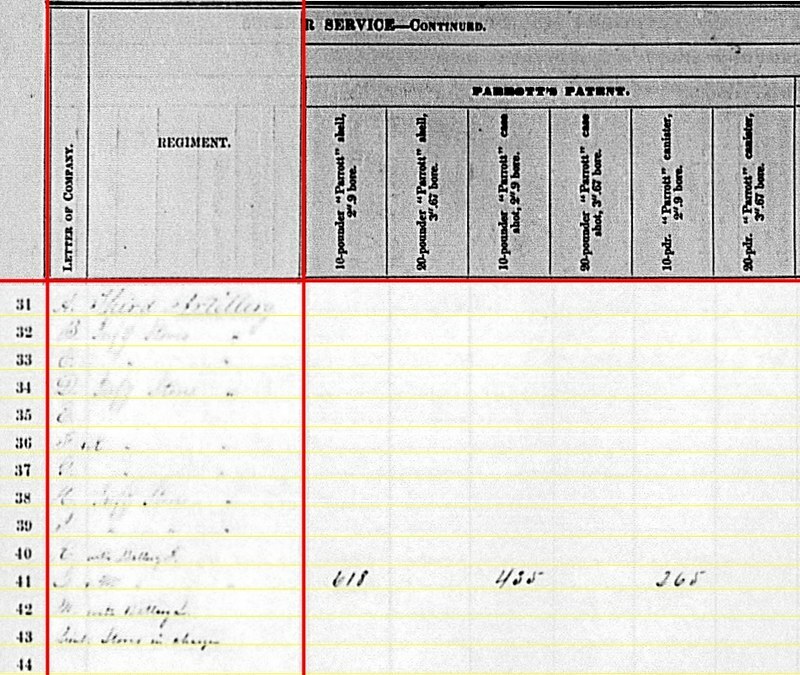 Lieutenant John R. Myrick was in command. Battery F – “With Battery K” at Potomac Creek, Virginia. Battery G – No return. This battery was disbanded in October 1862. Battery H – “Infy. Stores” with location as San Francisco, California. Battery I – Also “Infy. Stores” but at Alcatraz Island. Battery K – At Potomac Creek with six 12-pdr Napoleons. Combined with Battery F (above). This battery, under Captain John G. Turnbull, continued to support First Division, Third Corps with the Army of the Potomac. Battery L – “with Battery M” at Lexington, Kentucky. Battery M – At Lexington, Kentucky with six 10-pdr Parrotts. Assigned to First Division, Ninth Corps. Commanded by Captain John Edwards. Between twelve batteries only twenty-two field artillery pieces. Of course there were siege and garrison guns in California, just not a whole lot of them. The gunners would wait until later in the war for some big weapons to guard the Golden Gate. Battery A – 148 shot, 112 case, and 216 canister for 6-pdr field guns that teh battery no longer had (supposedly). 454 shell and 240 case for 12-pdr field howitzer. And 408 canister for 12-pdr mountain howitzer. 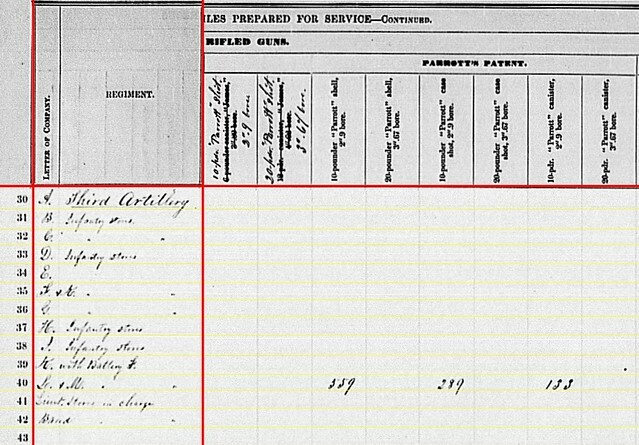 However, notice there is no column dedicated for 12-pdr field howitzer canister, rather just columns for “12-pounder canister, fixed” and “12-pounder mountain howitzer canister, fixed.” There were, as any good artillerist knows, three distinct 12-pdr canister types in this period. Might we presume the clerk entered 12-pdr field howitzer canister in the mountain howitzer column for convenience? Battery F/K – 360 shot, 96 shell, 198 case, and 104 canister for 12-pdr Napoleon. Battery A – 96 canister, 144 percussion shell, 130 fuse shell, and 288 bullet shell in 3-inch rifle. Battery C – 50 canister, 50 fuse shell, and 90 bullet shell in 3-inch rifle. Battery L/M – 618 shell, 435 case, and 265 canister for 10-pdr Parrott. Battery C – 30 shell for 3-inch rifle. Battery A – One Sharps carbine, 76(?) Navy revolvers, and 87 horse artillery sabers. 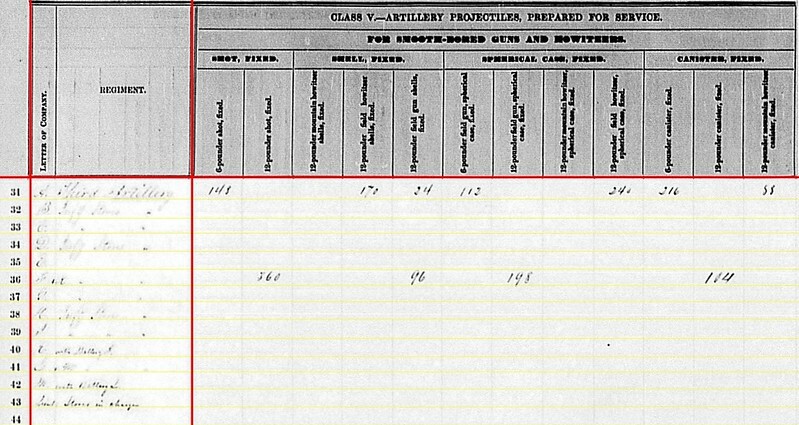 Battery C – One Sharps carbine, 36 Navy revolvers, 36 cavalry sabers, and 173… yes 173, horse artillery sabers. 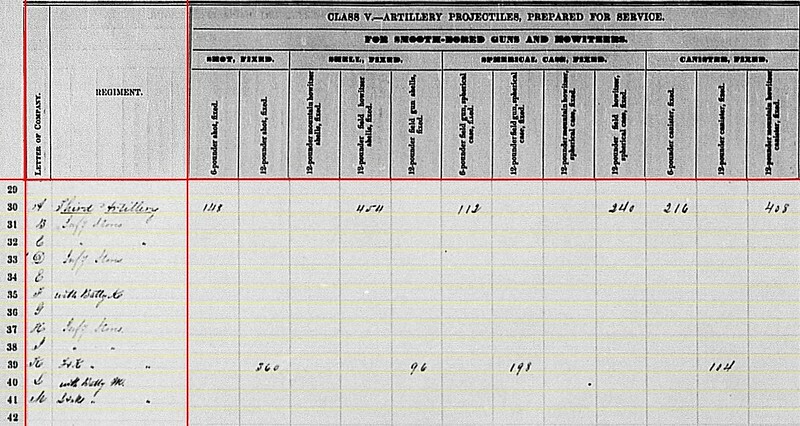 Battery F/K – Thirteen Navy revolvers and 45 horse artillery sabers. 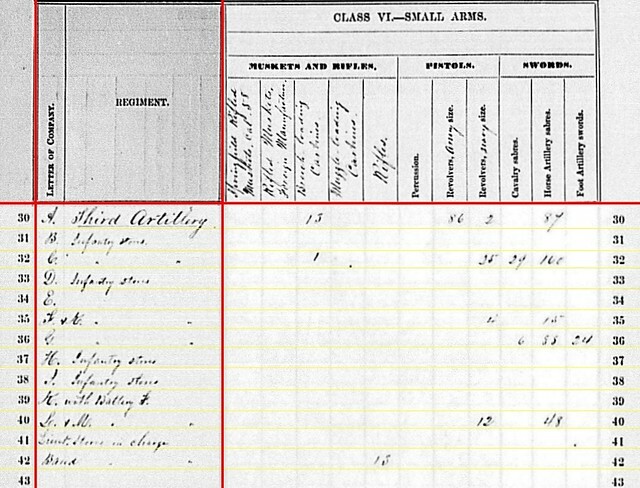 Battery L/M – Sixteen Army revolvers and 47 horse artillery sabers. For the four batteries reporting, that’s a lot of edged weapons. I would say that one gap in the 3rd Regiment’s summaries which I’d like to “cover” with research is the status of Battery E. I can guess and estimate, somewhat, what cannon were on hand by working against what I know was in the Department of the South (more accurately what showed up later on Morris Island). 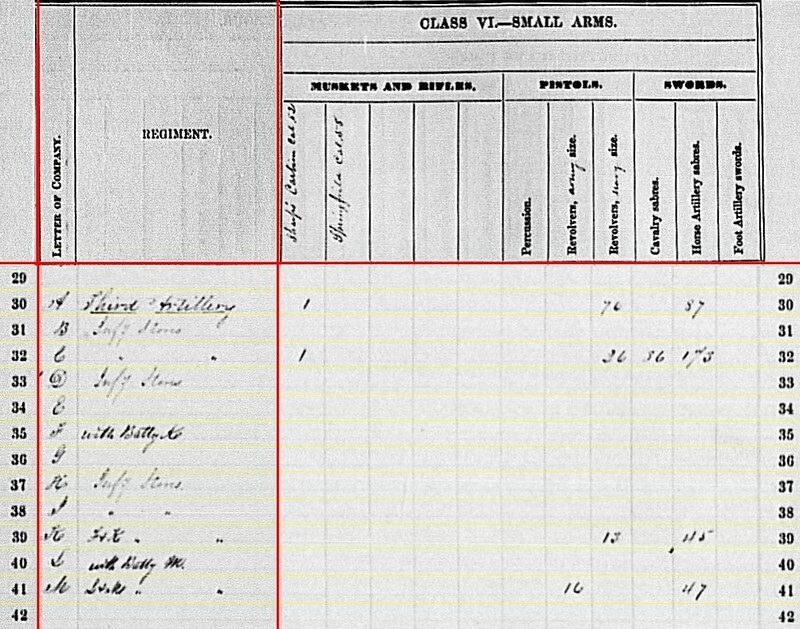 I also suspect that Battery E, like many others assigned to South Carolina, carried a lot of small arms. But the reasoning for that guess-work is not firm enough for my standards.